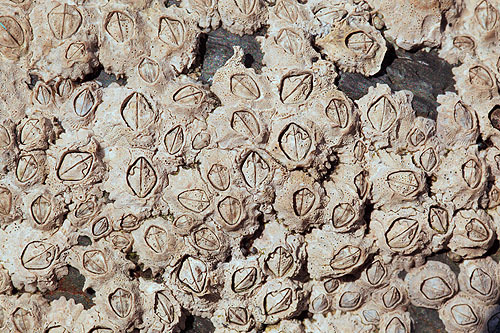 A closely packed colony of Barnacles . A species of Acorn Barnacle. The wide Rostral plate is just visible in a few barnacles , to identify these crustaceans as Semibalanus Balanoides? , the most common barnacle on the rocky British Shores. Reproduce by Self fertilization (permanent hermaphrodite). The 6 plates of the cone fuse together as the barnacle aqes. They are filter feeders , the barnacle reopens as the tide rises , using 6 pairs of feathery legs sweeping through the water catching food (plankton and detritus) from the water. The particles are passed to the mouth which is inside the shell plates.